In 2007, Nicole began working as a nurse in the medical oncology unit and strived to better understand her role in the area of oncology. After taking de Souza’s Chemotherapy and Biotherapy course, her interests grew. Nicole then attended a workshop led by Dr. Mary Jane Esplen, the Director of de Souza Institute, where she first heard about the de Souza Designation. According to Nicole, the de Souza Nurse Designation has been extremely valuable in developing specialized skills in chemotherapy and biotherapy, radiation, end-of-life care and psychosocial care. Nicole believes that she has been able to inspire other caregivers to continue advancing their knowledge. Nicole currently works as a Radiation Oncology Primary Nurse at the Northeast Cancer Centre in Sudbury with Dr. Julie Bowen. 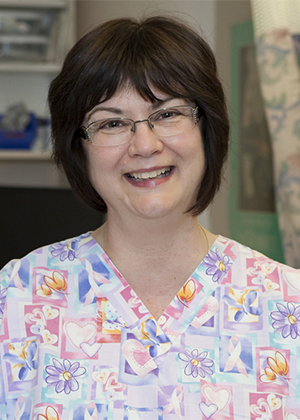 She confidently utilizes her skills in her daily practice with patients, their families and with colleagues. She encourages all nurses to take advantage of the knowledge de Souza Institute provides so they can apply specialized oncology education within their own practice.